Sero will be presenting its pump for low flow/high head applications featuring the new SHP high pressure side channel pump. It is suitable for the transfer of volatile liquids (high ends) in oil and gas, petrochemical, chemical industries and process engineering applications. Processes requiring high heads at low flows have so far been handled with pumps operating above synchronous speed or using large impellers with narrow passages. Now Sero has developed an innovative pump providing a secondary containment (barrel) for increased safety. 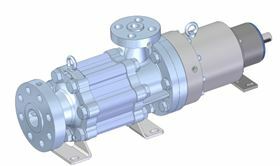 The SHP comes as a high performance side channel pump in single or mulstistage design, with mechanical seal or as sealless mag drive pump according to API 610. It offers heads up to 1200 m, and flows up to 8,5 m³/h. Nominal pressure is up to 100 bar.